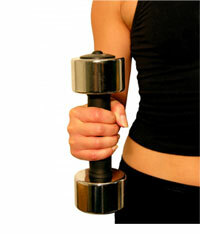 When it comes to weight loss and overall health as well as muscle tone, weight training exercises can be a great choice. The spine and the muscles in the back are designed for lifting and compressive forces much more than they are designed for other types of ‘shearing’ forces, so lifting weights makes sense for people who want to train to be in better shape, look better, feel better, and lose weight. Don’t be discouraged, though, if you initially appear to gain weight. Muscle weighs more than fat, so you’re distributing your weight in a healthier way. You will eventually lose weight, and you’ll be in much better shape, as well. There is still the potential for injury, though, so it’s important that you lift weights properly instead of just diving in and trying to lift too much too quickly. People can get seriously injured that way, and you don’t want to take that kind of chance with your own health, as it can seriously derail your weight loss and strength training goals. When performing weight training exercises such as dead lifts and squats, for example, it’s very important that you maximize the vertical compressive forces on the spine and minimize the horizontal, shearing forces. If the spine is pulled forward a slipped disc can result, and that’s very painful. It can also be a long-term injury and cause back pain and difficulties for years, so it’s much better to avoid it than to try to deal with it after it has already happened. How people handle squats and dead lifts can really affect whether they get the proper lift, whether they injure themselves, and how much of a benefit they are actually getting from the exercise. When done properly and coupled with aerobic exercises and proper eating habits, weight training exercises can be very beneficial for a weight loss program. The more muscle mass a person has the better off they are at burning calories when they are active, and they also burn more calories even when they are sleeping. It won’t happen overnight, but weight training over time definitely helps individuals move toward their weight loss and health goals. Weight training is also one of the safest fitness exercises, causing very few injuries when done correctly. You don’t need massive amounts of weight in order to do this kind of training, either, because you can use lighter weights and more repetitions, especially if you are new to weight training and/or are out of shape. It wouldn’t be advisable in that case for you to start lifting heavy weights right away. Make sure you take time to build up to heavier weights and that you also take time to learn the correct form for the exercises that you’ll be doing. While weight training is very safe you can get injured if you don’t do it the right way, so an understanding of why an exercise is performed a certain way is helpful to ensure that you continue to do the exercise the right way and don’t try to take shortcuts.